Overconsumption of meat by humans during the last decades has led to the development of large scale animal farming plants for the sake of massive animal food production. But overdoing with nature sooner or later ends up with detrimental effects on earth’s ecosystem. In the wake of the “International Bacon Day” (that was August 31) guys from Wren Kitchens UK, compiled this infographic and provide all we need to know about bacon! From its first existence to some weird and wonderful bacon creations. Click and bite the crispy! Being at the heart of summer season, it wouldn’t fit better than now to organize a BBQ party with some friends, relatives, neighbors or even your favorite colleagues. 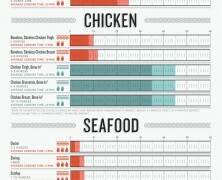 If it sounds troublesome to you, have a look at this “roasty” graphic that gives you the best grilling tips. Learn how to cook or do it even better! 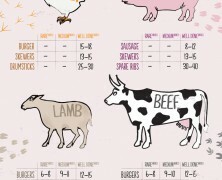 A handy reference guide for cooking lovers just to be on the safe side. 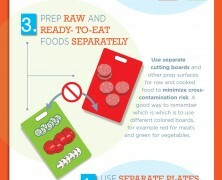 Extra food storage tips at the bottom. To find a printer-friendly A4 size version of the cheat sheet please click the publisher link on the left. Get ready for the next barbecue call and impress your friends with your grill magic. Learn how to cook tasteful, well-done and juicy roast goodies having just a watch and a meat thermometer as your “secret” weapons.